Who’s volunteering here at Sensations Memory Care Residence? One of our weekly volunteers is Pam. 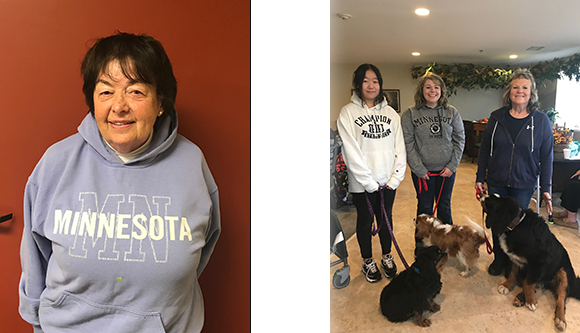 She volunteers her time and brings in her adorable dogs for our pet therapy session on Tuesdays. Our residents love being able to watch and pet the animals. Another one of our weekly Volunteers is Sandy. Sandy comes in and plays piano on Thursdays, which our residents truly enjoy. We have a few pop in volunteers, like High School Students looking to fill community service hours and lend a hand doing activities in the park. Along with Pastor Olson and Members from the First Lutheran Church that come to do bible study and sing hymns. Then we have The Women’s club choir, Cloggers, Zeta Phi Beta Sorority, and more. When was the last time you volunteered? Think about the last time you volunteered your time and talents for an important effort or cause. How did it make you feel? With all the chaos and day to day living, just the thought of volunteering might seem overwhelming, but in reality it could be very beneficial. It’s easy to think about the positive impact that volunteers have on others, but we don’t often consider how rewarding it can be for a volunteer to reach out and make a difference in someone’s life. Here at Sensations we absolutely love our volunteers. A lot of you have touched so many of our loved ones lives in many ways that we can’t thank you enough. We truly appreciate your time and dedication to our sensational family. Thank you so much.